Declan Treanor, Director of Disability Service at Trinity College Dublin, outlines the College’s new Neurodiversity Transition Hub Project and the role of the Autism&Uni toolkit in this initiative. The Disability Service in Trinity aims to develop clear and effective support systems at all stages in the student journey from university entrance to graduation to employment. The service has recognised that for students on the Autistic Spectrum (amongst other neurodiverse conditions), outcomes in Higher Education settings are varied, often uncertain, and less straightforward than peers who do not present with autism. Therefore, early engagement with post-school education providers, and exposure to post-school guidance and choices, has been deemed essential. 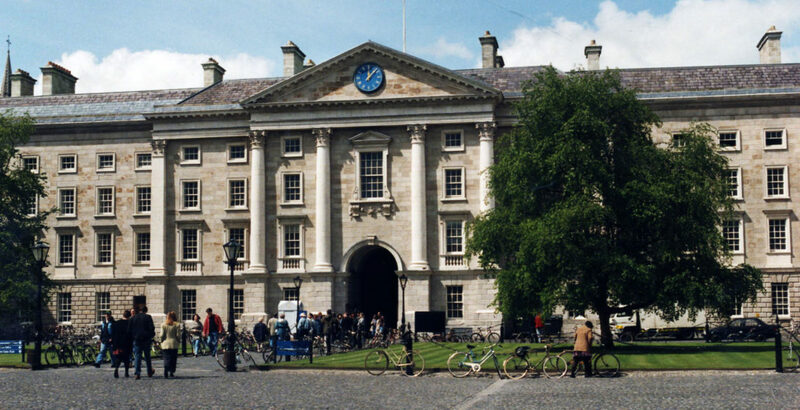 The Neurodiversity Transition Hub Project aims to welcome the Autism community into Trinity College Dublin, providing them with access to world class information and guidance during their higher education journey. Access to advice from Disability Service personnel – including Occupational Therapists, Educational Psychologists, Assistive Technologists, Disability Officers, Careers Advisors, Trinity Student Ambassadors and academic staff, can ensure that good choices are made around real future pathways. 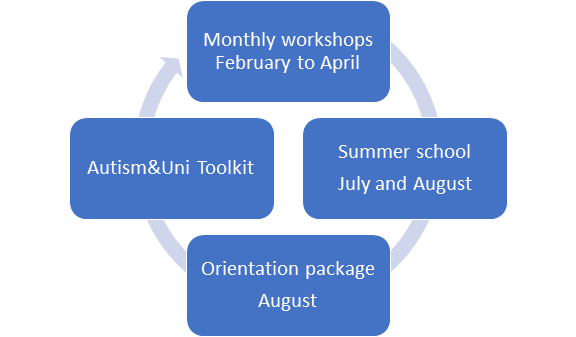 The Autism&Uni toolkit is one of four key components of the hub (the other three being monthly workshops, a summer school and an orientation package). With its underlying ethos that students can use it in their own time, do research about issues concerning them, and come back to it when particular difficulties arise, it plays an important role during transition. In combination with workshops and the summer school, the toolkit will help support students in the development of skills such as self-advocacy, communication, organisation, time management and goals setting. Students and parents will be introduced to these supports and how to access them prior to entering university through monthly workshops. The toolkit came pre-installed with some content. We then adapted and further extended the content to make it fit the Trinity context, including the physical campus environment, accessible information on the supports available to them, as well as advice given by current and past students. It was easy to integrate our existing resources, e.g. videos, infographics and text copy from other sources. Toolkit content is organised in a logical manner, focusing on direct calls to action. As part of the roll out of monthly workshops to prospective students and their parents, we also recruited academic and administrative staff to contribute to this project. Their involvement includes interacting with students and parents, for example, introducing their area of study and specific courses, talking about college life and the role of the student, and drawing attention to helpful points of contact. We are currently working on a series of staff interviews to populate the Professional Interviews section of the website, which we hope to supplement with guidance from current students. This allows students to easily navigate an information source that is easy to follow and links well across all of the transitions pathways required when thinking about university. The toolkit also provides students with links for additional support and with information on how to access and use those supports. This is an ongoing activity as content will be added and adapted based on the viewpoints of students and parents / guardians.